Above, pills containing a combination of the opioid oxycodone with acetaminophen, commonly sold as the brand name drug Percocet. 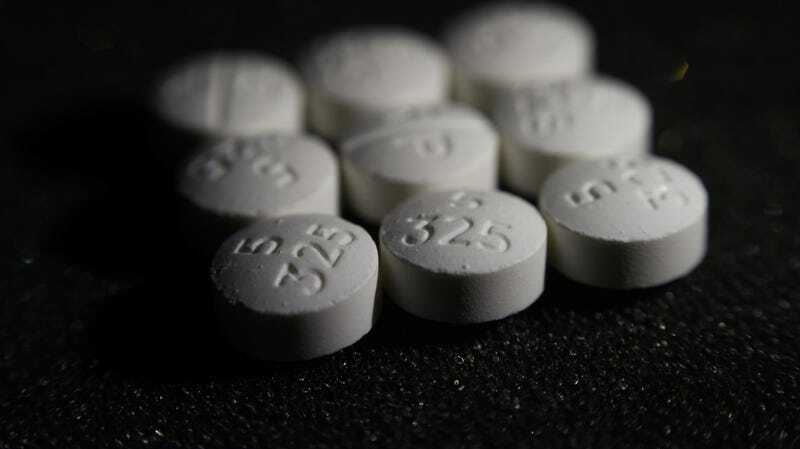 Despite a growing awareness of the dangers and risks of opioid addiction among doctors and patients, the average amount of opioids prescribed to Americans over the past decade has barely budged, suggests a new study published Wednesday in The BMJ. But it’s difficult to know just how much this reality accounts for the current, worsening state of the opioid crisis. While we know roughly how many opioids in total are legally prescribed to Americans every year, there’s less reliable information on who exactly is taking these drugs, and how much of a dose they’re getting on average. Previous studies trying to figure this out have mostly only studied people living in a single state or enrolled on a single insurance carrier, making it hard to generalize their findings to the greater public. To remedy that, the researchers of this current study instead looked a national database of prescription claims made by people on private insurance as well as Medicare Advantage plans, a form of the government-funded insurance program that is managed by commercial insurers. People are universally eligible for Medicare once they turn 65, while younger people might qualify if they have certain disabilities. Advantage plans bundle the different types of Medicare typically provided by the program, such as hospital and prescription drug coverage, as well as other benefits like vision and dental coverage, but might come with higher out-of-pocket costs or other drawbacks. The database allowed the researchers to track opioid prescriptions made by 47 million Americans from 2007 to 2016. They found that the annual rate of opioid use had stayed flat between the beginning and end of the time period, though there were some year-to-year fluctuations. There were also large differences in opioid use between people on different types of insurance. The overall rate of annual opioid use rose to its peak around 2012 and 2013, but fell back to or stayed slightly above 2007 levels by 2016. In both 2007 and 2016, for instance, 14 percent of people on private insurance reported being prescribed opioids, as did 26 percent of people on Medicare ages 65 and older, and 52 percent of disabled Medicare carriers. The average daily dose of opioids taken by people in each group actually slightly rose between the years, with disabled Medicare carriers taking the highest daily dose. Rates of long-term opioid use, which accounted for the majority of prescriptions doled out, similarly stayed stable throughout the years. “Opioid use and average daily dose measured at the individual level have not substantially fallen from their peaks, despite increased attention to opioid abuse and awareness of their risks,” the authors wrote. Despite the sobering findings, it’s important to keep a few things in mind here. Though it’s true that increased legal opioid use has helped drive the opioid crisis, especially in its earliest years in the 1990s, most people who use painkillers as prescribed do not develop a substance use problem. And the especially high and rising number of annual overdose deaths seen in the past few years has largely been tied to more potent opioids sold and available illegally, such as fentanyl, not prescribed opioids. It also isn’t entirely clear that reducing legal opioid use will necessarily prevent more deaths, at least if done in a haphazard manner. Such policies, the BMJ authors noted, might only drive especially desperate people to purchase more dangerous drugs somewhere else. Doctors and patient advocates have argued that more restrictive prescription policies, such as the ones currently being considered by the Centers for Medicare and Medicaid, will harm chronically disabled and cancer patients who have no other pain treatments available. All that said, an estimated 40 people a day now die from prescription opioid overdoses, a figure fourfold higher than it was in 1999. And given that the U.S. is by far the largest consumer of opioids in the world—using 88 percent more prescription opioids per capita than Germany, the second country on the list, according to research cited by the study authors—with no better health outcomes to show for it, it’s hard to argue against the need for improvements in how legal opioids are prescribed and used.